Team MTN-Qhubeka p/b Samsung made history at the 98th edition of the Tour of Flanders as the first African team ever to participate in this 259km cobbled classic. For Jay Thomson, Sunday’s race was the realization of a longstanding career goal and an incredible opportunity to gain World Tour experience. The team’s Director of Health and Performance, Dr. Carol Austin, analyzes the numbers and gives an accounting of just how hard the race was. The route was 259km and included 6 flattish cobbled sections and 19 asphalt and cobbled “Helligens” (short, steep climbs). Jay’s directive for the day was to get into an early break and to support the performance of team. His data from the “First Hour” clearly demonstrates his efforts and commitment. The data shows multiple 20-60 second anaerobic bursts; attacks and counters that he made an in attempt to breakaway. His normalized power was 370W, very close to his current FTP of 390W. 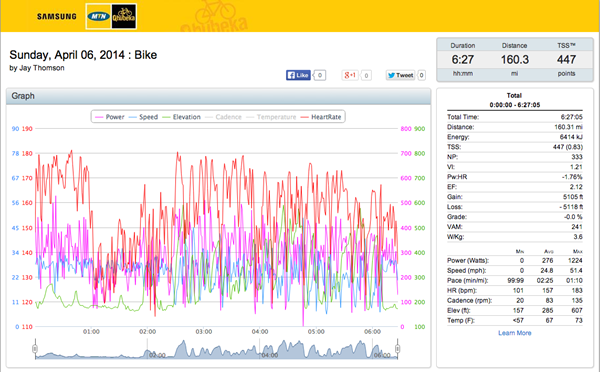 To see Jay’s fully marked SRM power file on TrainingPeaks click here. One-hour into the race an eleven-man breakaway group pulled ahead successfully, and the pace of the main peloton steadied. As Jay was not part of the breakaway group he sensibly reduced his effort and focussed on recovering and minimising his energy expenditure by positioning himself close to his teammates mid-field. His data for this 90-minute period through to the base of the first climb showed an average power of just 220W, and heart rate of 141bpm well within Jay’s personal “endurance zone”. The start of the toughest section of the race route was marked by the first ascent of the Oude Kwaremont climb at 106km. During the next 2:30hrs/96km Jay maintained his position mid pack (approximately 80th place) and powered over the first nine Helligens and 6 flat cobbled sections. His average and normalized powers increased substantially to 288W and 350W respectively, reflecting the increased load and pace/power fluctuations. His data clearly shows the repeated 1:30-5min high power (ave 400-450W), lower cadence, high torque efforts demanded by the climbs. On his second ascent of Oude Kwaremont Jay was poorly positioned, feeling the fatigue induced by his first “hour-of-match-burning-power”, and lost contact with the front group. Over the top of the climb he was only 15-20 seconds off the leading group, but his attempts to chase back on proved fruitless. 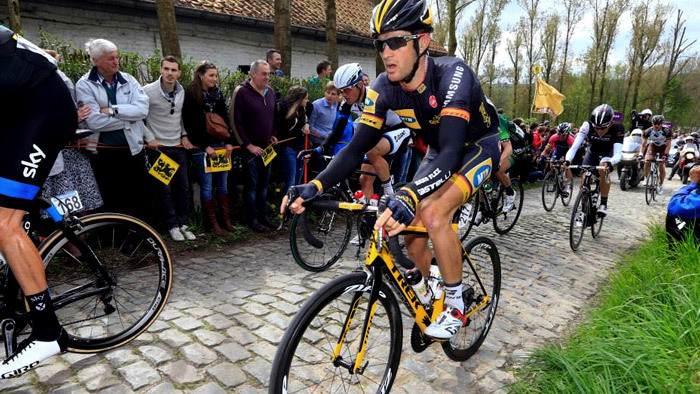 Jay settled into a steady rhythm, single-mindedly focused on his goal to finish his debut Flanders. For the final 55km he maintained average and normalized powers of 283W and 324W respectively. Jay finished the race in 99th position, +12:38 behind three time race winner Fabian Cancellara 6:15:18. “Overall I am am super happy with my performance and have taken a lot out of the race.” says Thomson. The summary data outlines the brutal power demands of Jay’s race. What the data doesn’t reflect are the additional stressors that animated the race; competitive positioning within the 200-strong world-class peloton, narrow roads, crashes, technical failures (wheel/bike changes) and the concentration/mental demands. Dr. Carol Austin is Head of Performance Support and Medical at Team Dimension Data for Qhubeka. She is a medical doctor and endurance sports coach committed to inspiring and developing African talent for world class performance. Carol has lead the team's sports science and medical team since 2008. You can follow her on Twitter at @DrCarolAustin1 and Team Dimension Data at @TeamDiData.